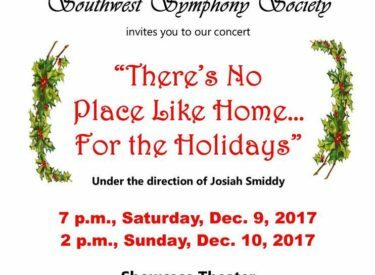 The public will have two opportunities to enjoy the Southwest Symphony Society’s concert, There’s No Place Like Home…For the Holidays,” at 7 p.m. Saturday, Dec. 9 and 2 p.m. Sunday, Dec. 10. Both concerts will be at the Showcase Theater on the Seward County Community College’s campus. Admission is a free-will donation at the door and refreshments will be served. Orchestra performers will include: First Violins – Bethany Adams, Christopher Seeman, Blinda Massa, Rebekah Strand; Violas – Nancy Allen, Alison Rice; Cellos – Susan Chesnut; Bass – Troy Skinner; Oboe – Alisa Henderson; Flute – Jerilee Rediger, Marieka Ford; Clarinet – Shelly Rowson; Trumpet – Brian Stuckenschmidt, Chris Ford; French Horn – Amy Whitaker, Karen Elmore Graybill; Baritone – Elizabeth Denoyer; Tuba – Austin Gallaway; and Piano – Alisa Henderson. Vocalists will include Angela Smiddy, Stephanie Drymalski and SCCC music students.